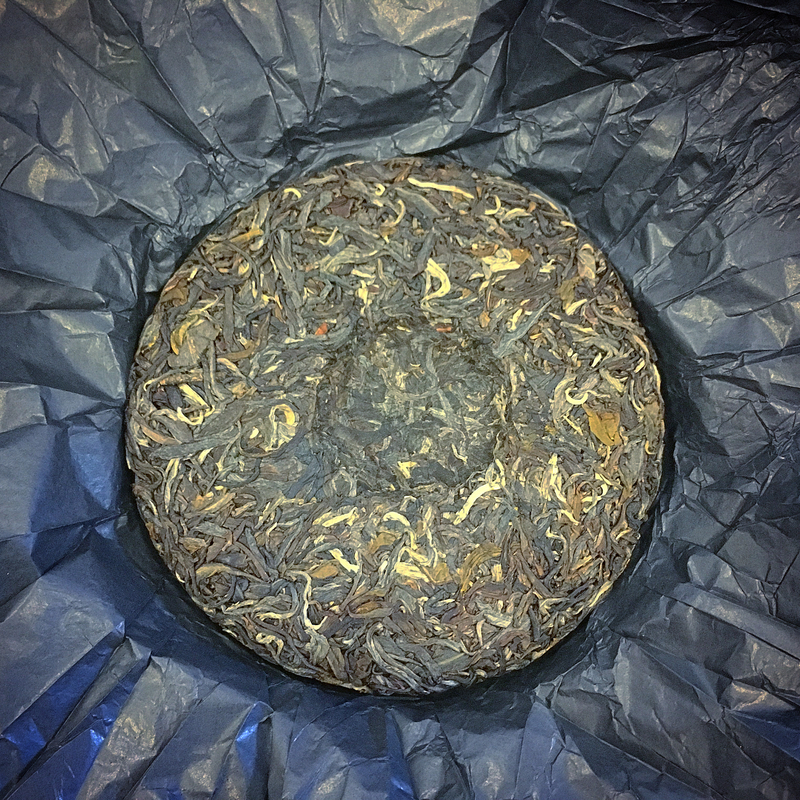 Kuura‘s first raw pu’er offering debuted back in August 2017 with the release of “Vector”: a blend of spring 2017 material from Menghai. I picked up a cake of it back then (I think they sold out pretty quickly) and have been enjoying it these last few months. They recently released their autumn range, which includes an updated “Vector” made in the same spirit as the first one, but notably the material is different. I do not have the newer one but hopefully they are similar enough that a review of the first is still helpful for those considering the second. Vector is Kuura’s lower-priced raw pu’er cake, intended to be suitable for daily drinking. (I recently reviewed “Rhizome”, their premium offering.) As with all of Kuura’s range, the material is selected from farms that have good biodiversity and agricultural practices. I’ve had a few sessions with this tea since I acquired it ~4 months ago, but I’ll base this review off a fresh session. This means the cake has had some time to chill out. Hitting it with near-boiling flash steeps in my clay pot (12s pour) yields a healthy bitterness with medium body. There’s a small amount of sweetness and also some complexity that I don’t remember being there before. This may be due to its extra age or just my faulty memory. There’s none of the unpleasant ‘green/unripe’ taste that’s often in (usually) low quality young raws. An astringency starts building gradually. The bitterness subsides quite a lot but the complexity remains. It is hard to describe but reminds me a little of smokiness, although that’s definitely not it. Both the sweetness and astringency continue to build, and I start to feel the energy of this tea towards these later steeps. Extended steeps bring out considerable sweetness and a thicker body. Astringency is high around the periphery of the mouth and back of the tongue. This tea doesn’t quit, either – lasting longer than I have time to finish exploring (well over 15 steeps in total). By this time I’m also feeling the tea’s energy continuing to build. A review of the @kuura.co "Vector" #rawpuer cake is linked in the bio. This is their version 1 cake from August rather than the version 2 available now, so there may be some differences! This is their daily drinker (as opposed to their more premium "Rhizome" cake that I reviewed a couple of weeks ago). The energy off this tea is quite something. It doesn’t peak too high for me, but lasts for an extremely long time. I am still feeling it over 8 hours after the end of my session, along with a very light menthol sensation down the throat. Vector is $49 AUD ($38 USD) for a 200g cake, which comes to 24.5c/g AUD (or 19c/g USD). This places it towards the cheaper end of the young raw price spectrum. Taking into account the complex taste, the energy and longevity of the tea, and the relatively low price, I think this does indeed make a good daily drinker for someone experienced with young raw pu’er and who can handle that energy. It’s probably not the best choice for introducing to a newcomer but certainly not the worst either.